You are at:Home»Asia»Japan: Stop misreading the data. Start seeing opportunity. As Japan’s expansion continues, compensation and especially savings are improving. The BOJ can now shift policy to avoid conflict with the structural reforms needed to grow exports. True or false? “Japan’s Longest Stretch of Economic Growth in 28 Years Ends.” It depends. If measured as real (adjusted for price level change), seasonally adjusted, quarter-over-quarter and annualized Gross Domestic Product (GDP), then true. If measured as real, percent change from a year ago, then false. Viewed four-quarters, 1Q2018 was the thirteenth quarter of expansion, although fifth weakest. The year view better reflects decision cycles of businesses and investors and avoids seasonal complications. When reading the most recent Cabinet Office national accounting data, realize that the data are 1) “headline” aggregate averages hide answers, and 2) country comparisons are often more appropriate per-person. What contributed to first quarter weakness? Compared to 1Q2017, the only negative was Private Residential Investment. Decelerating were: Household Consumption, Change in Private Inventories, and Net Exports. Net exports are notable because they are so variable. They are a concern because exports are dependent on global growth. Weak growth in Europe and trade issues with the U.S. matter. Consumption of Households is 54% of GDP, the category with the most deceleration. 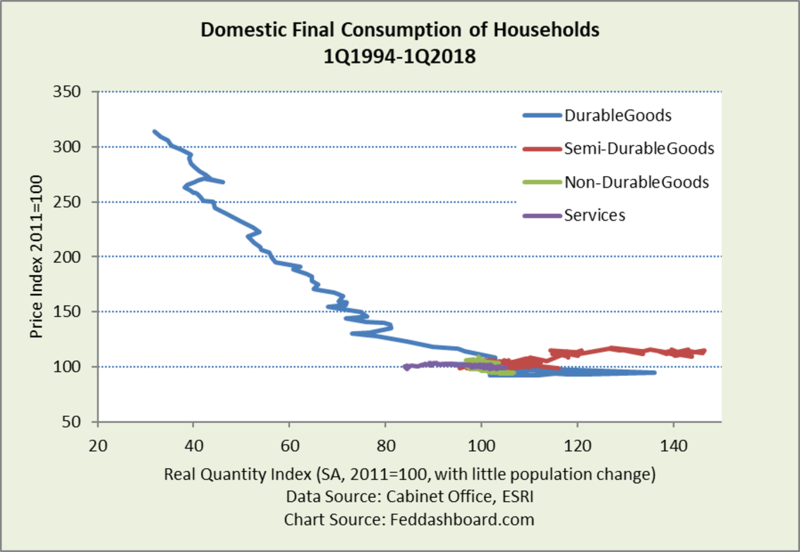 Household consumption had 0.9% growth in 4Q2017, slowing to 0.26% in 1Q2018; again, compared to the same quarter in the prior year. Shoppers splurged and then cut back April 1, 2014, when the Value-Added Tax (VAT) increased and the Bank of Japan (BOJ) was aggressively trying to increase prices with quantitative easing (QE). The most remarkable growth has come in durables (blue line below) in the time track of price and quantity purchased. Shoppers buy more – not less – as prices fall. This data is the opposite of the theory that says prices must rise for purchases to grow over time. On the demand side, influences include energy conservation measures on non-durable purchases and demographics on a decrease in children’s clothing. Labor has been falling as a production input. This reduces wage pressure on output prices. Where capacity is most constrained is in personally-delivered services, such as child care or package delivery. Yet, even in personal services, such as health care, Japan is aggressively pursuing robots. In the mid-1990s across industrial countries, costs for durables fell enough that the average price began to fall as shown in “Central bankers: time to learn from political analysts.” This flattened the average price for goods as seen in the price-quantity chart above. The Bank of Japan’s Opinion Survey on the General Public’s Views and Behavior reflects the clash between public perception and BOJ’s attempts to implement pre-1980s theory. Over the past three surveys, 6.2%-8.4% of respondents expect prices in the next year “will go up significantly” – far less than the BOJ policy aims. About two-thirds expect prices “will go up slightly.” Looking out five years, over 20% expect a significant increase and about 60% a slight increase. Surveys from other sources reveal further conflicts. 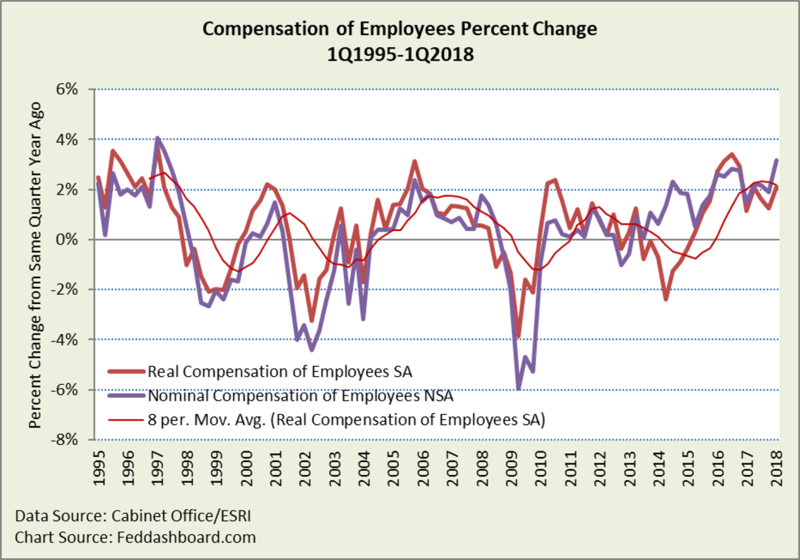 In addition to shopper strength, employee compensation has been growing for about the past four years, nearly at pre-Asian Flu highs. Japanese shoppers showed strength while paying down debt through 3Q2012. Recently, compensation has been rising faster than spending, contributing to savings, and historically rare. Pushing consumers to spend, rather than save, is possible. The question for policy-makers is how much savings is bad. Shoppers have been solid for years. Yet, the first quarter was different. Most interesting is how shoppers bought fewer durables and semi-durables, even as prices fell (“less for less,” rather than the typical “more for less”). 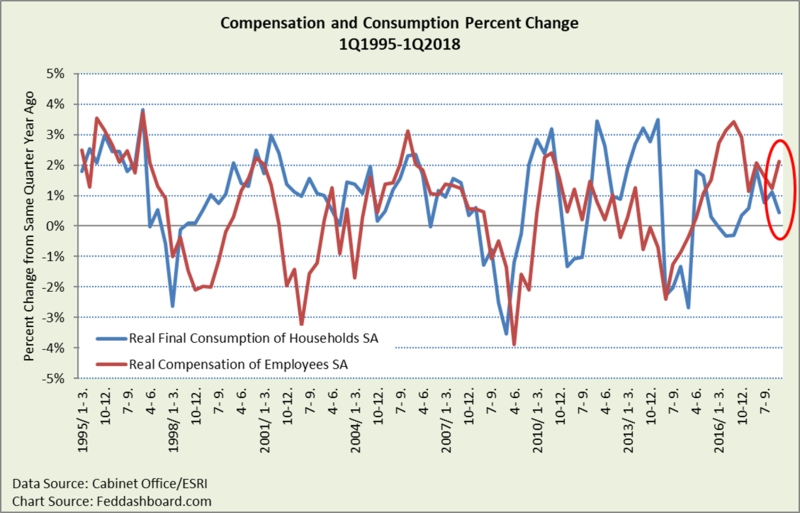 A question is whether the lower spending is due to short-term reasons such as the shock of the 5.56% increase in non-durables prices (annualized from prior quarter), savings preferences, satiation with consumption, demographics, or other. Different causes require different actions. Japan’s weak aggregate consumption isn’t about purchases per person, it’s about people – in number and demographics as seen in its population pyramid. Japan needs babies. The scale of needed export growth is more than major industrial countries are capable of generating in additional demand, unless Japan significantly grows market share. Large countries like Japan need emerging market growth with hundreds of millions of consumers seeking a boost in living standards. For countries to develop they need political stability, security stability, and rule of law. China, with its “long game” view, is making investments across the global south. Japan has recognized this and increasingly acting. Japan’s opportunity is to leverage its heritage of managerial and technological innovation to continue to lower costs and prices, improve product management, and more safely seize opportunity in emerging markets. Editor’s note: This post was updated June 8, 2018 after the secondary preliminary data release. 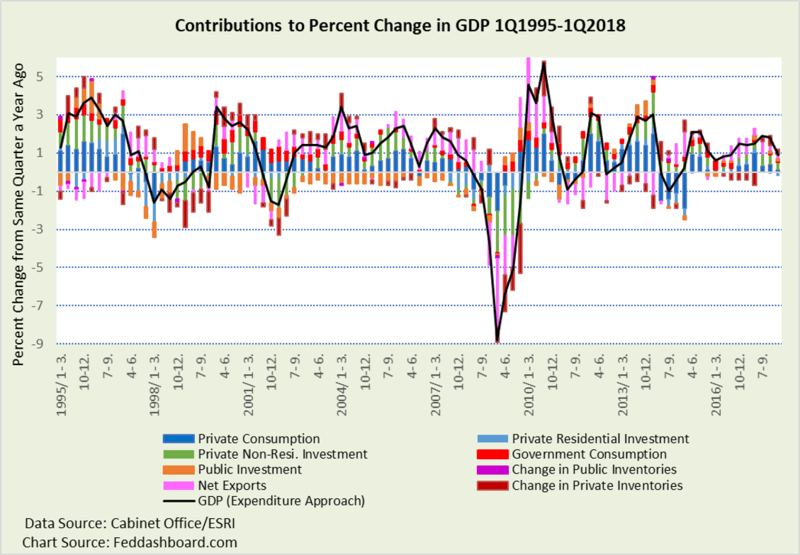 Primary change was an improvement in Private nonresidential investment, now with the same contribution to GDP as in the prior quarter. Next Article No, productivity is not widely weak. Companies are dynamic.